Radioplayer gets new interfaces for smart devices | What Hi-Fi? The radio platform has a new look on Sonos, Google Chromecast and Amazon Echo devices, adding some neat new features to its skillset. Radioplayer has got a whole new look on certain smart devices. The collaborative radio platform now has added features on Sonos, Google Chromecast and Amazon Echo speakers. The new interface for Sonos streamlines the experience by presenting the listener with content specific to their country. That means Brits can choose to only see UK radio stations and programmes. 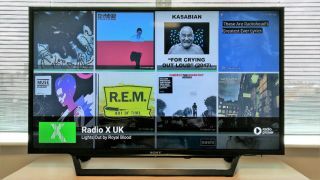 As well as saving listeners time scrolling through international stations, it also lets Radioplayer offer high-quality streams from UK broadcasters such as the BBC, including premium content and live sport. To check out the new Sonos interface, add Radioplayer as a Music Service within the Sonos app, then select your country of choice from the A-Z list. Radioplayer has also added its new 'skill' for Amazon's Echo range of speakers. You can now play named stations and ask Alexa for recommendations. Ask "what's playing?" and Amazon's virtual assistant will respond with the name of the track, artist, programme and station. Station logos also now appear in the Alexa companion app on your smartphone or tablet. Lastly, Radioplayer has updated its app for Chromecast. It now features a live feed montage on the TV screen, including album art, social media posts and programme info.